The work of Brühwiler (b.1939) – also known as Pabrü – spans six decades. It is personal, provocative, polychromatic, witty, critical, humanitarian and visibly hand-made, defying conventional notions of Swiss design (such as ‘Swiss Modernism’ and the ‘International Style’). Brühwiler completed a graphic design apprenticeship in Lucerne in the late 1950s, just as Swiss Modernism was making its mark in Basel and Zurich. 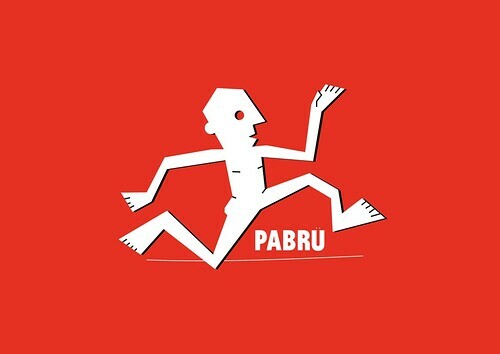 ‘Running man’ identity for ‘Pabrü’ exhibition designed by Falmouth student Joseph Bradley Hill. Top. 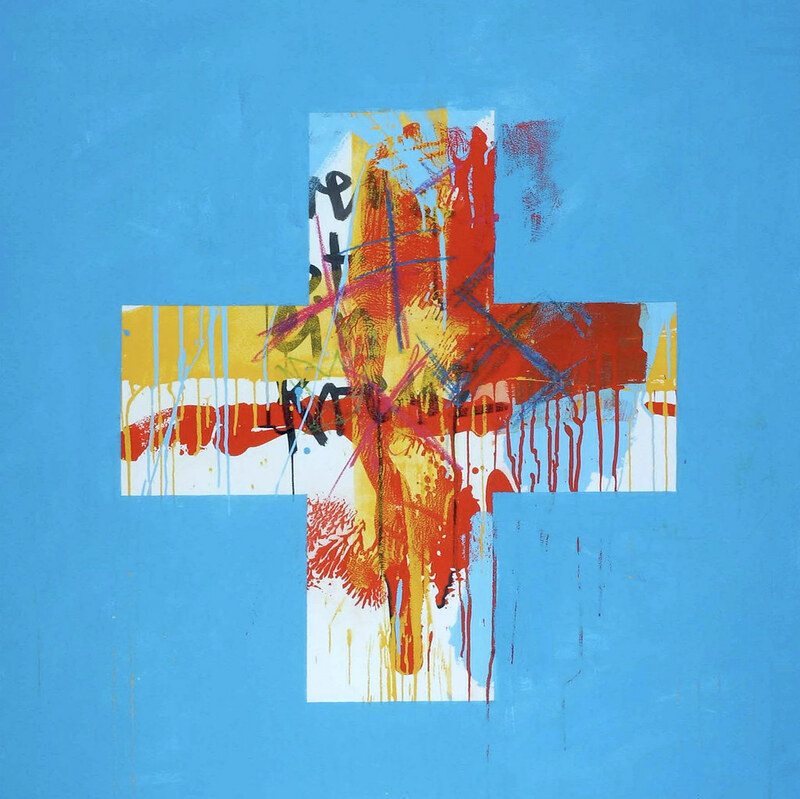 Detail of Kreuze, oder die Achse des … [Crosses, or the axis of …], painting by Paul Brühwiler, 2004. All subsequent images by Brühwiler. However Brühwiler knew nothing of this world: in 1960 he left Switzerland for Paris; in 1965, moved on to California. Going from studio to studio and sleeping in his car, he hoped to fulfil an ambition to design title sequences for films. Eventually he landed a job in the studio of Saul Bass. Later, he worked at the studio of Charles and Ray Eames. Poster promoting UK rock band Wishbone Ash, ca. 1970. At the Eames’s studio, mathematicians and scientists were as integral to the projects as the designers. ‘It was like going to university,’ says Brühwiler. 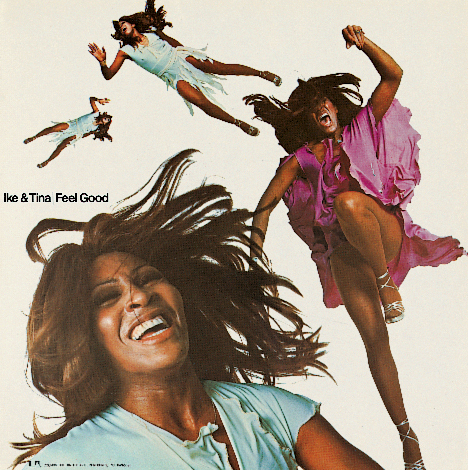 Although he did not get to work much in film (though he appears – as the man in the picnic – in the Eames’s film Powers of Ten), his US experiences enabled him to set up his own studio in Los Angeles in 1969, designing LP covers and posters to promote, among others, Frank Sinatra, Ike & Tina Turner, Wishbone Ash and the late Marilyn Monroe. 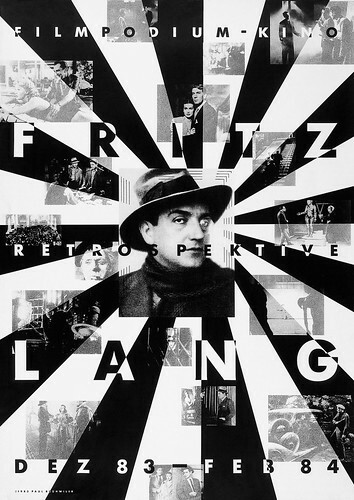 After returning to Switzerland in 1973 without contacts, Brühwiler knocked on the door of Bernhard Uhlmann, founder of the Zurich Filmpodium, and asked if he could design posters for him. It was the beginning of a highly productive partnership that lasted almost twenty years, from 1975 to 1994. 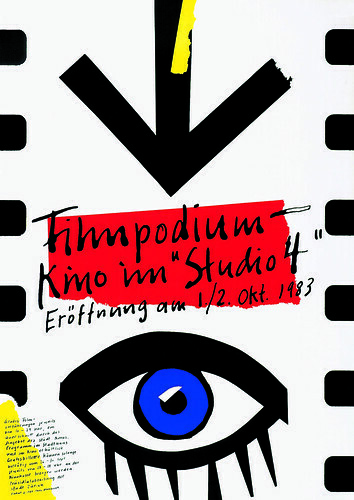 Poster for Filmpodium, Zurich, 1983. The exhibition interweaves Brühwiler’s biographical story with reflections on his approach as a designer. In addition, Falmouth University students have written new critiques of his posters, looking at gender, narrative and semiotics. There is a taste of mid-twentieth century methods of design (recently explored by Briar Levit in her documentary Graphic Means) and there is a parallel narrative within the exhibition on graphic design practice. Both Brühwiler’s work and the poster as an artform are embedded in the twentieth century, but Brühwiler’s desire to use graphic design to bring a wider critical reflection – that goes beyond the client’s immediate message – remains relevant today. 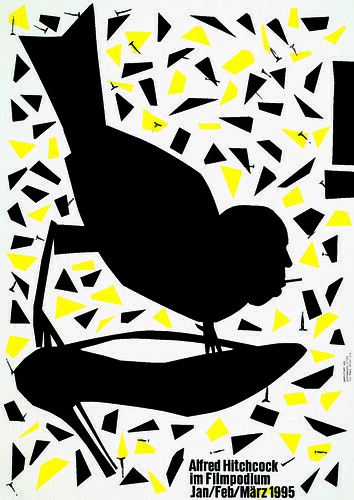 Poster for Filmpodium, Zurich, 1995. 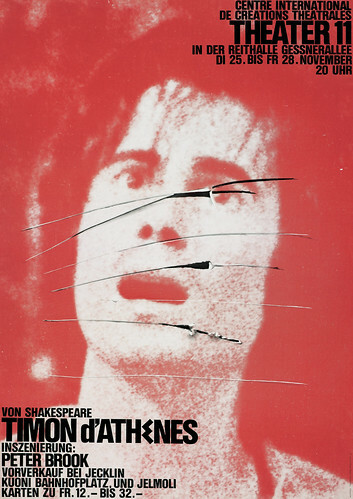 Poster for Peter Brook production of Timon of Athens, Zurich, 1975. 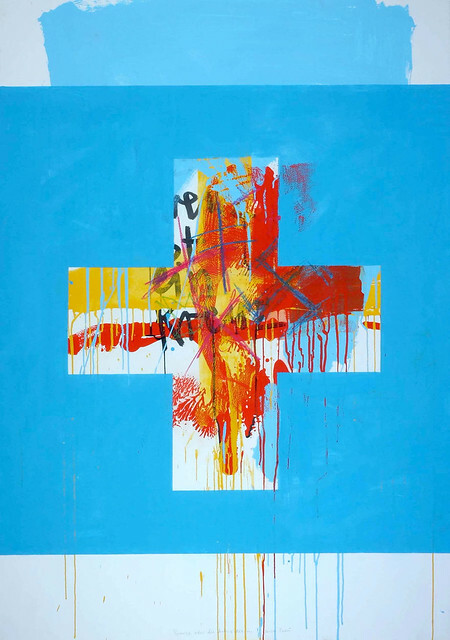 Kreuze, oder die Achse des … [Crosses, or the axis of …], painting, 2004. ‘Pabrü’ opens at 6pm on 23 March and runs until 4 May 2018 at the School of Communication Design, Falmouth University, Woodlane Campus, Falmouth, TR11 4RH, UK. Curation team: Jessica Jenkins, plus students Joe Hill, James Cook, Kit Swann, Caitlin Westgate, Domile Jursenaite, Chandler Massey and Theo Pence. If you wish to visit during the Easter break (26 March – 6 April 2018) please call 01326 211077 to check for opening times. Closed 30 March – 2 April inclusive.